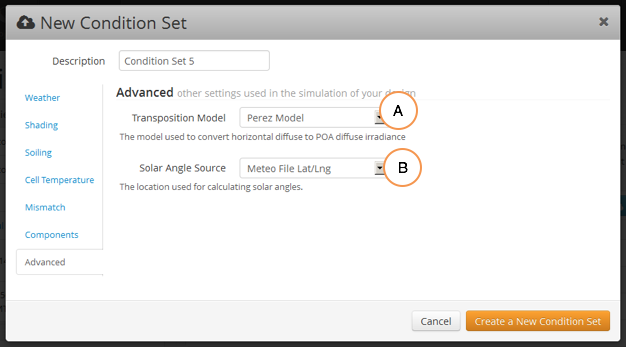 A Condition Set describes the environment around the modeled solar array. A Condition Set includes a number of assumptions around the specific weather conditions, shading patterns, and soiling losses. In many cases, the default values are appropriate, though they can always be modified. C. Use radio button to select the desired weather file. The default choice will be the closest weather file, but that can be modified. 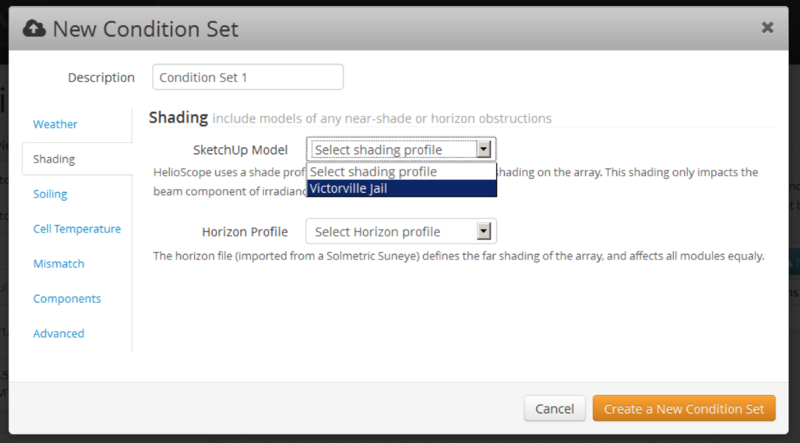 If the Project has shading, choose the relevant Shade profile and/or Horizon Profile to be included in the Condition Set. Note: the Shade Profile must have first been loaded (see Section 8) before a Shade Profile can be added to a Condition Set. 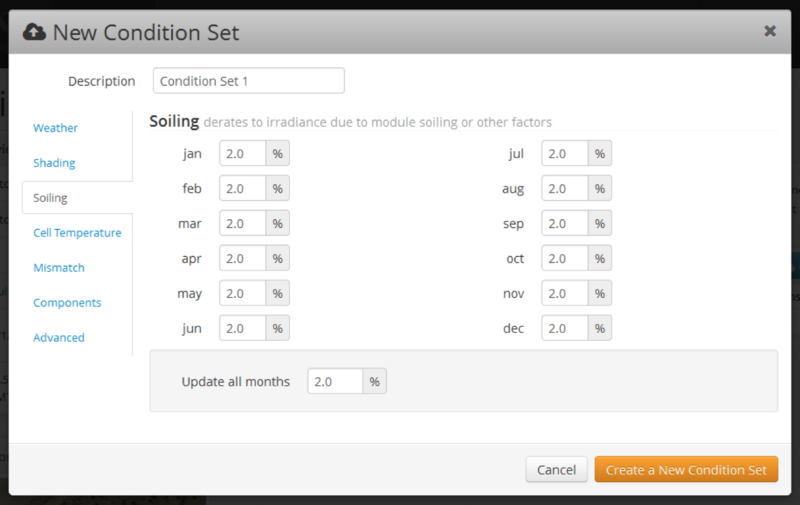 Soiling losses are reductions in the irradiance that reaches the module, taken at the surface of the module. Confirm the assumptions, or modify monthly soiling factors. 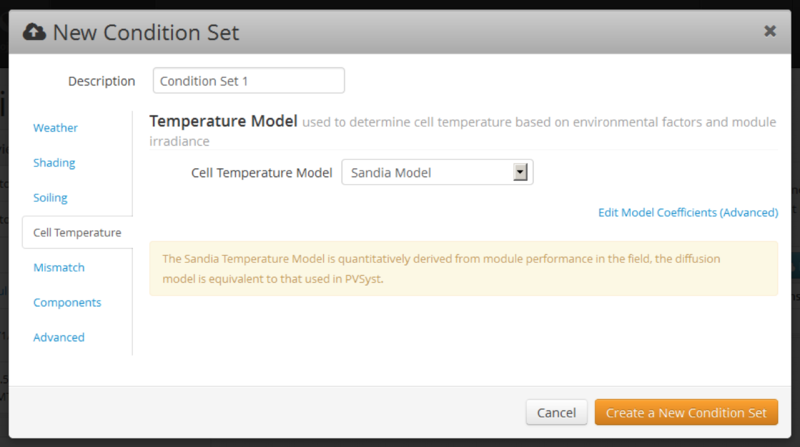 HelioScope supports both the Sandia Labs Temperature Model, as well as the Linear Diffusion model (used by PVsyst). 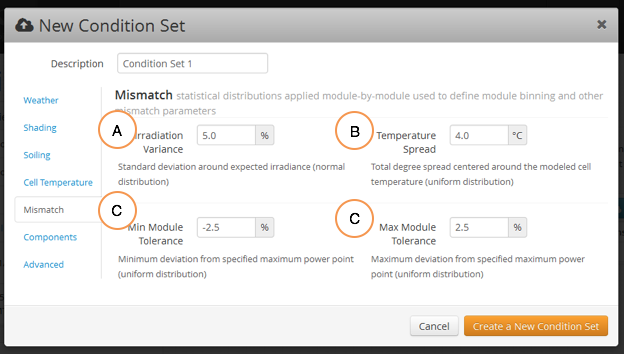 For either model, Click “Edit Model Coefficients” to view and modify the temperature coefficients. C. Module manufacturing tolerance (uniform distribution). Note that this parameter has two inputs, to account for positive-tolerance module binning. The Design defines the specific module SKU used, but if a module has multiple PAN files, these are configured as part of the Condition Set. 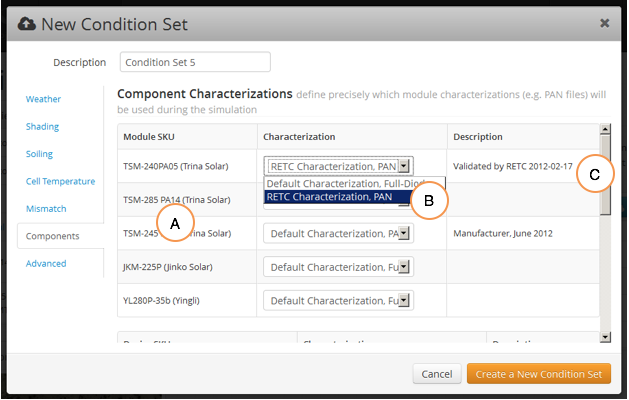 From this page, you can manage the characterizations used for each module or inverter. A. The window will show the full list of modules used on any Design in the existing Project. B. If a custom PAN file has been loaded, or if multiple PAN files are available, then they are configurable via the drop-down menu. C. Where possible, the source of the PAN file is indicated. A. Choose the transposition model (the mathematics used to convert diffuse light to plane-of-array irradiance). Perez can generally be used with high-quality weather files, while the Hay model is better used with lower-quality weather files. B. 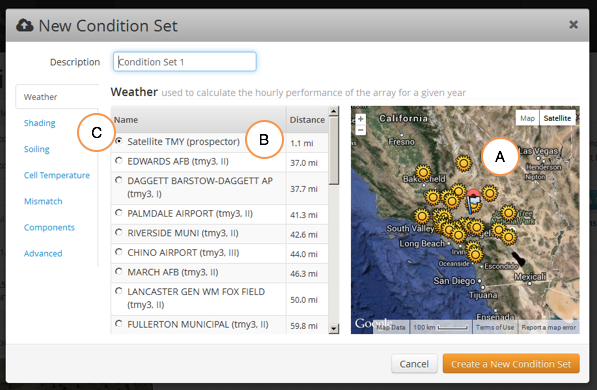 Choose the location that is used for calculating solar angles (either the location of the weather file, or the project latitude and longitude).